If you’re lucky enough to be able to work remotely you know that it doesn’t come without its challenges. Sometimes you need that separation between home life and work life. So here’s some local coffee shops in Durham that have an abundance of caffeine, free wireless, work-friendly layouts and sense of community. The Durham Hotel is a popular, boutique hotel downtown. It’s one of my favorite spots to work from simply because how beautiful it is. I mean, look at that! The floor to ceiling windows give it an airy feeling even on the rainiest of days. The staff is always exceptionally kind and we love how much space there so it never seems too crowded. Kaffeinate is a quaint little Brightleaf-adjacent coffee shop. Their coffee is heavenly and their service is always excellent. Plus the atmosphere is warm and inviting. We love that they have plenty of outlets and reliable wifi. The perfect combination for getting work done. Plus their music is always on point, I tend not to wear my headphones here because of that! Bonus: Get 10% off your purchase every time with your Shop Durham card. You’d be hard pressed to find another outdoor space that is this beautiful, has great coffee, and wi-fi to work from. One of the best patios in Durham. Don’t let the outside fool you because Namu is absolutely beautiful on the inside! They have a gorgeous bamboo garden topped off with a water fountain and koi pond, tons of outdoor seating that is pet and kid friendly. Plus, they have some unique coffee drinks you may not find otherwise. If you love coffee, you have to come here. No questions. Cocoa Cinnamon has three Bull City locations and each has their own unique character. I personally prefer the Lakewood location for working because it is the largest and there is usually no issue finding seating. Their coffee will rock your world plus you get the scent of freshly made churros while you work. Bonus: Get a free churro with any drink purchase with your Shop Durham card. We are big fans of this funky cafe. The staff is always wonderful and willing to answer any questions I have about their unique drinks. The prices are affordable. Their house made syrups make all the difference in their self roasted coffee brand. The first time you come you may question it being in a strip mall. Who has good coffee in a strip mall? Yep, Bean Traders does. The space is surprisingly large and there are plenty of outlets to plug in. Bonus: Get a small cup of coffee with 1 bean purchase using your Shop Durham card. You’ll find Mad Hatter’s steps away from 9th Street. My number one reason for loving this place? The dessert. Their black and white cake is dreamy. (I love it so much it was our wedding cake!) So I tend to come here in the afternoons to work when I need a good sugar buzz. The space is large and you can usually find seating, although it can get busy during the school year because of the proximity to Duke’s campus. They have their own parking lot as well. I never thought that I would be frequenting hotel coffee shops to work from, but here we are again. 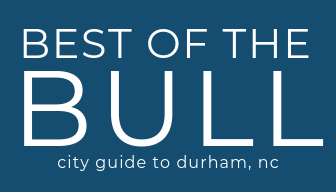 I have a thing for these boutique hotels in Durham. Unscripted has a coffee shop by day and a bar by night. I’m a big fan of comfy couches to work on and they have an abundance of them. Their coffee is great and plus, I use my Shop Durham card to get a free cup whenever I go. If you’re from here you know that parking downtown can be a major headache. Good news is that Unscripted has their own parking garage, just have to pay hourly. Bonus: Get a FREE small cup of Toby’s Estate Coffee every visit with your Shop Durham card. We love this spot on 9th street because it tends to be quiet and there is plenty of seating. There’s actually two floors- I prefer sitting upstairs because of the natural light. The baristas are friendly, the coffee is good, and the prices are reasonable. There are plenty of outlets which also makes it ideal for working or studying. Saint & Co. is a bakery café offering all things related to dough. Delicious variety of fresh pastries and great coffee. Everything is baked in house and you can tell. They also serve toasts, salads, paninis, beer, and wine as well as a cocktail on tap every day. Notes: Their sweet pastries and tarts are works of art for an insanely reasonable price. Although they’ve got a full espresso bar, it takes a backseat to their insanely good baked goods. Their space is light-filled and cozy- you want to spend all day here. There’s also a bookshelf filled with children’s books to keep the kiddos entertained. Food: Full bakery with croissants, scones, cakes, pies, and more. Their savory pies and soups make the perfect lunch.